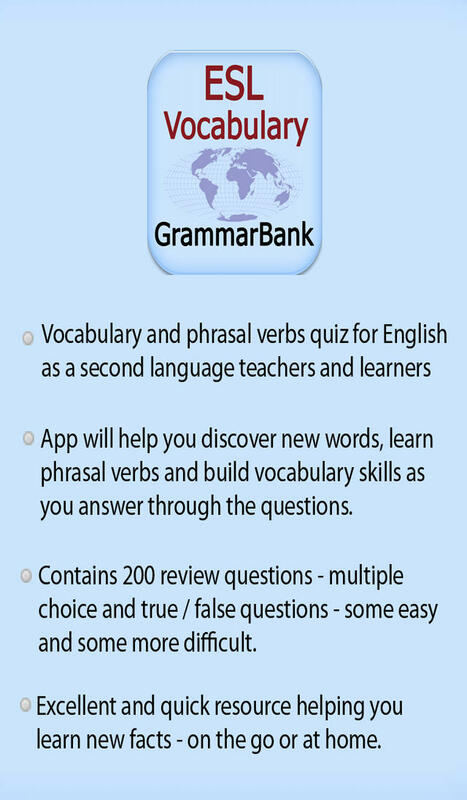 This app provides to you a Vocabulary and Phrasal Verbs Quiz for English as a Second Language (ESL) teachers and learners. This app will help you discover new words, learn phrasal verbs and build vocabulary skills as you answer through the questions. It is best if you look up all the words that you are unfamiliar with in the dictionary even if they are not the correct answer. Every word counts! You will definitely learn new words / phrases and reinforce your knowledge as you use this app! This quiz provides 200 questions covering a range of English Words / phrases - some easy and some more difficult. It’s a great review app for any one studying for an ESL exam - or just wanting to improve your command and knowledge of the English Language. You can choose to answer 10, 25 or 50 questions. The questions will be randomized so that each time you take the quiz (for example 25 questions) you will get a different set of questions. At the end of the quiz, you will be shown the total number you got correct and your percentage score. The app contains 200 questions - both true/false questions and multiple choice. It's great as practice app that you can use to test what you have learned or also as a refresher that you want to use as you prepare for or just before taking an exam. Try this unique ESL Vocabulary Quiz - GrammarBank today and you’ll be glad you did!